Something crazy has happened. The Stitch Swap became much bigger than I was anticipating. At the time I'm writing this (Tuesday night), there are nearly 270 people signed up. Umm...what?!? It makes me so happy that so many of you are wanting to stitch something up for someone you don't know. Of course, there is the excitement of receiving embroidered happy mail, so I can't blame you! I'll leave the sign up page open until 6PM CST tonight, then it's closing. UPDATE: Sign ups are now closed. You'll find full details about the swap on the original post. Needless to say, with so many people participating, it could take a while to get the emails out with your swap partner. So, if you are signed up, please be patient with me. I hope to have all emails sent by the end of the day on Saturday, which is a bit later than I originally planned. In the mean time, I've set up a Flickr group for the Stitch Swap! Add your photos of work in progress, finished pieces ready to mail, or your package when it arrives! Just be sure to keep sensitive information out of the photos. And, if you're participating, why not grab the badge below to show off that you're in the swap? 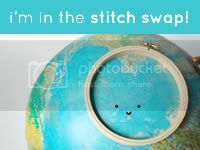 It links to the page I've set up for all of the Stitch Swap essentials. Okay, folks...let the stitching begin! Oh, and happy Leap Day! eeeep!! I am so excited for this!!! I can't wait to start stitching!! PS Happy Leap Day!! You are most welcome to participate as a beginner! Do you best, and I'm sure it will be appreciated! Thanks! Looking forward to receive my "mate"! This is such a creative idea! I just signed up :) excited to start thinking of designs... And know that I'll receive a little fun thing to decorate my cubicle with! hope everyone involved have fun! I hope there's going to be another one soon! This is going to be so much fun. And know that I'll receive a little fun thing to decorate my cubicle with! looking forward to all the good things your blog shares. What a success. Glad it went so well even thou I know its a lot of work for you. Thanks! So cool! I just grabbed the button and stuck it in on blog. So excited to do my first embroidery project! 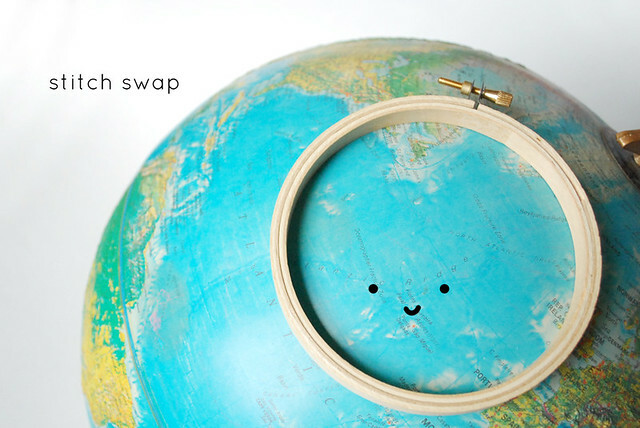 I have just found your lovely idea for a stitching swap - I realise I am late but is there any chance you could allow me to sign up? I would love to take part as I have recently started to embroider and would love an opportunity to hone my skills! Oh, I am sorry. I can't take any people this time around, but enough people have expressed an interest that I'm sure we'll do this again soon. Thanks for letting me know - I will look out for the next one! Thanks for this post. Signed up and did not see an e-mail from you so I was worried. I'll patiently await my stitch swap partner. Thanks for updating us and for organizing Mollie!!! hi! i'm in the stitch swap, and i tried to copy and paste the button to my blog, but blogger is telling me there are "illegal characters"...i don't know enough about html to correct it. no one really reads my blog, but i'd like to have the button as a link for instuctions. if you can help, thanx!